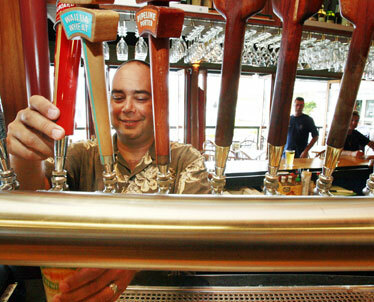 Mattson Davis, president and CEO of Kona Brewing Co., pours a pint at the company's Hawaii Kai brewery, which opened in December 2003. Maybe the brewer, the sales guy, the general manager and the handyman look back to 1994 and chalk everything up to good timing. » Beers: "We have 14 different beer styles on tap at the brew pub, and we sell through them all," said Rich Tucciarone, director of brewery operations. Bottles include: Longboard Island Lager, Fire Rock Pale Ale, Big Wave Golden Ale and Pipeline Porter. » Seasonals: Wailua Wheat (spring/summer), introduced last year, and Pipeline Porter (fall/winter), introduced in 2006. A new limited-release bottled beer is expected next year. The isle brewery market was in a lull. Koolau Brewery Inc. and Honolulu Brewing Co. had closed a few years earlier. Alii Brewing Co. and Gordon Biersch Brewing Co. were also new brewers here, and production of Primo, a longtime isle bar staple, was dwindling. Then again, maybe it was the coasters -- a calling card used by the original team that built Kona Brewing Co., now known as Hawaii's largest brewery. "We gave out a lot of coasters," says Mattson Davis, president and CEO, who was recruited in Portland, Ore., 11 years ago by Kona founder Cameron Healy. He's kicking back on the deck of the brewery's Hawaii Kai brewpub, surveying a few full pints of beer. "At our peak we were shipping out 2 million coasters a year to our accounts in Hawaii -- it started out small and it kept growing." Of course, Mattson says the quality of the beer is what is really behind the growth in Kona's sales, which have jumped by more than 20 percent statewide this year. But Hawaii is hardly the whole story anymore. Kona brew is distributed in 17 states, Japan and Guam, after a push this spring that added distribution in a half-dozen Southern and Eastern states. Beer drinkers in Texas, Georgia and the Carolinas are now staring at surfers cruising breaks in the shadow of Diamond Head or hiking by a simmering volcano. Mattson calls that "liquid aloha," and craft beer enthusiasts are drinking it in faster than it is being made. In Florida, one of the strongest Kona markets, the company is on pace to beat its sales estimates by more than 50 percent. "Our labeling and our names are very powerful connections to Hawaii," he says. "When you are looking at our packing imagery and tap handles, you know it's Hawaii, and Kona Brewing Co. is Hawaii, Hawaii is Kona Brewing Co. in that mix." "I definitely see growth in the future. There is room for all the local breweries here." With the distribution capability of St. Louis-based Anheuser-Busch Cos. and brewing capacity in Portland, Kona is on track to increase its production by 59 percent in 2008. Overall sales are up more than 70 percent this year over last, when Kona was ranked the 24th-largest craft brewery in the country by the Boulder, Colo.-based Brewers Association. Maybe that's no surprise to Hawaii's craft beer faithful, with Kona accounting for more than 15 percent of all draft sold in isle restaurants. "I definitely see growth in the future. 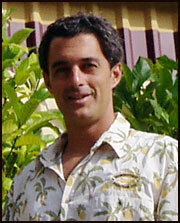 There is room for all the local breweries here," said Rich Tucciarone, who has led Kona's beer production since 1999. "Craft brew sales have steadily increased for 36 to 37 years." Tucciarone last year oversaw the brewery's expansion, which included a new chiller, drive-in keg cooler, fermenter and loading dock. Last month, Kona extended its whirpool tank to get more beer through its production facility, which brews "as much as we possibly can," he said. While originals Fire Rock Pale Ale and Big Wave Golden Ale, as well as Longboard Island Lager, introduced in 1998, remain top sellers, new limited-release draft beers, including last fall's Oceanic Organic Ale, sell out quickly, Tucciarone said. Next month, Kona will officially become part of Anheuser-Busch's Craft Brewers Alliance, which will also include Portland-based Widmer Bros. Brewing and Seattle's Redhook Ale Brewery. That network, Mattson says, gives Kona the ability to use Anheuser's nationwide distribution system, quality control and sales teams. "You all grow together; it can't be just one," he says. "People want innovation; they want fresh; they want creative; they really want something they can relate to, some sense of place."